When you have more than one email account it can happen to you that you aren't always alert of the new messages that you receive in your inbox, so you may need to resort to a tool like Cyber-Info E-Mail Notify, that will let you know about each of the new inbound emails. 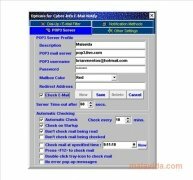 For the program to work properly you have to configure your email service, selecting the POP3 address that it uses, the user name and the password that allows to access the account. The program offers you the possibility to select a key with which you inbound mail tray will be checked instantly, as well as adjusting the kind of notification that you will receive, be it acoustic or visual. The interface is somewhat outdated and it may not look too appropriate for the latest Windows operating systems, but if you are looking for an efficient notifier, this can be one of the best alternatives. Download Cyber-Info E-Mail Notify and discover the most simple way to know when you have new emails.